Single? Dating? Then join Australia's first quality accredited, professional introduction service. Vital Partners guarantee confidentiality. All phone calls are made on a strictly confidential basis. All mail in unmarked envelopes. Interested in meeting like-minded professionals today? 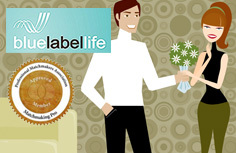 Blue Label Life are Australia's leading professional full-service matchmakers. We act as your Personal Agent endeavouring to find your perfect match. We offer a service where security and value-based compatibility testing are an integral part of the matching process. Why wait? Be proactive and join today!. If you are single and would prefer not to be, the decision to contact Yvonne Allen and Associates could be the best step you could take toward your future happiness. Your personal life is too important to leave to chance! One of Australia's most successful Introduction Agencies. Hearts United is a successful Introduction Agency, with members all over Australia and New Zealand, of all ages and walks of life. Catering to couples looking for a genuine relationship with a view to something permanent. Our consultants have over 17 years experience in the industry and are focused on helping people meet their perfect partner in a confidential and professional setting. Chemistry is the key, but take some of the guess work out of dating! Do you want to find a partner or increase your circle of like minded friends? We have a large client base, which provides you with more opportunities to find someone special. Working monopolises time, leaving less for meeting and knowing someone. We offer opportunities to meet people with similar values who are unattached & interested in discovering new horizons. Welcome to After Work: Sydney's fastest growing and most active social club for business people who want to make new friends. The Club provides a rich variety of activities including drinks evenings, dining out, parties, theatre and cinema trips, night clubbing, weekend walks, holidays, excursions and sports. Six men, six women, good company and good food! Dinner Douze creates a safe, relaxed and warm environment where single people can meet and enjoy a great meal and friendship. We choose a restaurant with ambience and set up a dinner for twelve. It creates a space for opportunity, for that extra magic to happen, without the pressure or the expectations of a date. Three single men and three single women, with similar interests, in a similar age group, will meet and have dinner together at a Sydney restaurant. Introduction agencies and Dating agencies are a fantastic way of meeting like-minded people in today's busy, fast-paced environment. More like the old fashioned way where you pay money and the agency does the work for you, they help you find a like-minded partner for a specified cost. Matchmaking services are a perfect alternative to pubs and clubs ... completely confidential and you know you are meeting genuine singles that are prepared to invest cash to meet someone suitable for a relationship or friendship. There are many different dating and introduction agencies in Australia all of them offer a different twist on their dating services, such as Six For supper, Afterwork social club or Vital partners. These are introduction agencies that are a lot more personal and intimate, they give you a chance to sit down one on one with the agent and really show yourself to the agency so that they can in turn find a suitable partner for you. Dating agencies offer a personalized service where they ensure that they know as much as possible about you and the people they introduce you to. There is no blind factor such as online dating where you do all the searching yourself, your time is not taken up with trawling for possibilities rather it is spent enjoying the company of potential suitors – hand picked for you by these agencies, you pay the money and they will search for your ideal partner yourself. An initial consultation is just the beginning of extensive contact between you and your consultant. A lot of people prefer a dating agency as opposed to online dating because they would rather let themselves do the talking in person, giving him or she a chance to let their true personalities shine. Introduction Agencies and Dating Agencies require involvement and personal time from you. They will give you the dedicated and special consideration you request. So let your chosen dating agency find you your partner now!